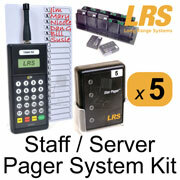 FoodSoftware.com offers complete professional restaurant server pager kits for the lowest prices anywhere! Compare: five-pager systems are normally sold by POS dealers for $700 - $900. Look in the margin to the left under Server Pagers to go to listings for server pager systems of other sizes. You can see their prices and add them to your shopping cart from their respective pages. Call us at 805-375-7000 for quotes on unlisted or custom systems. 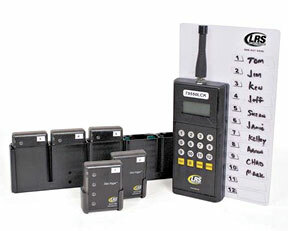 Guest Pagers: Look in the margin to the left under Guest Pagers for details about the LRS Guest Pager Starter Kits. Transmitters: Transmitters are usually mounted on a wall in the kitchen or prep station. There are twelve numbered one-touch call buttons. Pressing a one-touch button sends a signal to the corresponding pager that makes the pager vibrate strongly but silently. The server will feel the vibration but there will be no pager sounds heard in your restaurant. This starter kit system includes five pagers. You can have any number of wait staff overall but you only need five pagers if you only have five servers on the floor at any given time. Servers can be assigned the pager's ID as pagers are handed out or pagers can be given the server's ID. Pager belt holsters are used instead of belt clips. The pagers themselves do not have protruding parts so clips cannot be broken off. The starter kit includes spare belt holsters. Pagers are set to System ID 9. The transmitter is set to System ID 9. Increase the charger rack capacity from 5 to 10 pager bays to easily expand the total pagers in the future. Select the same system with 7 pagers instead of 5.